Young puppies are naturally inquisitive creatures. From the moment they start walking, they'll want to explore their surroundings and get into trouble. When you bring a new puppy home, this behavior is great. It gives your pup the chance to learn more about his or her new home. But when is it safe to bring your pup outside? The answer to that question is a bit complicated. Puppies are very susceptible to illness. When they're feeding off their mother's milk, they're getting great antibodies to keep them safe. However, when they're finally weaned off, that protection is gone. That is why we rely on vaccinations. Vaccines help to prevent potentially fatal diseases. 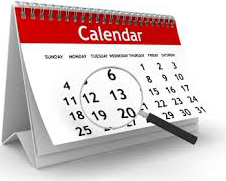 Unfortunately, the series of vaccinations takes 16 weeks to complete. Most puppies are brought home at about eight weeks of age. Does that mean that you have to keep them cooped up in the house for two months? 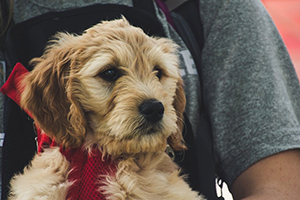 When your new pooch gets vaccinated, they're getting protection from rabies, parvovirus, distemper, and more. While the world may seem relatively safe to us humans, canine diseases are lurking around every corner. Diseases spread quite easily. They can be found in feces, urine, and even grass. It's not uncommon for young dogs to catch diseases from simply sniffing the same area that an infected dog smelled. Parvovirus, in particular, is notorious for sticking to objects. The virus can stay alive for up to one year on floors and other inanimate objects. All it takes is a lick or sniff for your pup to catch it. Needless to say, it can be very dangerous to take your dog out for a simple walk. Truth is, you can never know if that spot your dog stops to sniff on a walk is infected or not. As a result, it's best that you avoid taking your dog to public places until they're fully vaccinated. Another reason why you should avoid long walks around the block is overexertion. Puppies need to sleep. 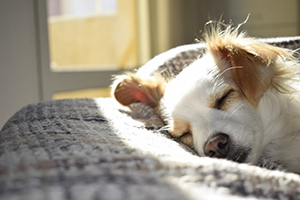 In fact, most dogs younger than three months old spend 20 hours per day sleeping. While many new owners want to hit the ground running and set their pup up for a life of athleticism, it can do more harm than good. Too much exercise can affect the way your puppy grows up. The growth plates don't fully close until a pooch is at least one year of age. When your dog gets a lot of exercises, they're putting a lot of stress on their skeletal system. They need to develop muscles slowly. Doing so too fast can lead to bone damage, skeletal deformities, and joint problems. Does My Dog Need to Be Confined? With all the scary diseases and risks out there, it may sound like the best option is to keep your dog confined inside all day. However, that couldn't be farther from the truth. Your dog can go outside the minute you bring them home. In fact, they'll need to go outside during training. The key is to limit their exposure to potential risks. 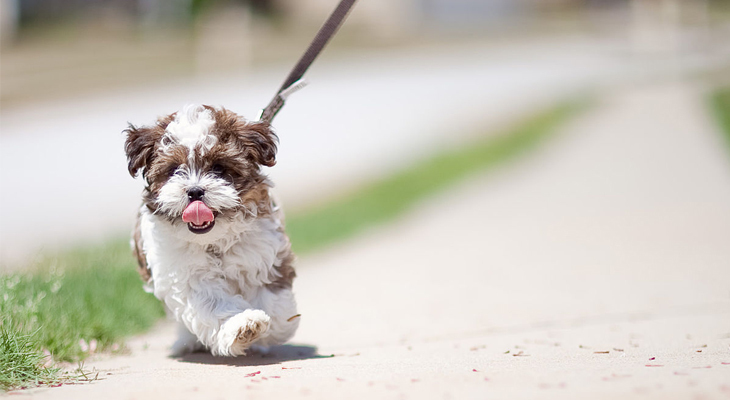 You can take safety precautions to ensure that your puppy stays safe while they're outside. The best way to do this is to provide them with a safe and contained space. A backyard that's completely fenced in is perfectly safe. As long as no other dog can get into your backyard, they'll be fine. A contained outdoor space is relatively free of diseases. If you want to add another layer of protection, you can prepare your yard ahead of time. Keep the grass short and keep your pup away from any damp areas. If it's possible, let your dog have some fun in the full sunlight. A dry area is less prone to be carrying bacteria and pests. During their first couple of months at your home, this should be the only place they're allowed to roam free. They'll get used to the space and learn to love it. With careful training, it'll also be the place where they do their business. At about 16 weeks of age, you can start to bring your dog out more. This is only if they have had all their vaccinations. While your dog can't roam free in an uncontrolled environment due to a weak immune system, it is possible to expose them to new things. Your home is their safe space. However, if that all they ever see when they're young, it can make new experiences difficult when they're older. They can exhibit fearful behavior, making simple visits to a vet or dog park tough. To keep your pup safe from diseases, you have to get creative. One of the easiest ways to show your furry friend new sights and sounds is to keep them off the ground. Young pups are very small, so they're easy to keep in your arms. Take your puppy to a local hardware store or pet shop. Have them in your arms at all times and don't let them touch the ground. By not being on the ground, they're not at risk for coming in contact with something an infected dog touched. It's a great way to show your dog around the world while strengthening your bond. If your pup is on the bigger side, you can invest in a stroller. Don't place your dog in a shopping cart. They're unsafe and may have been exposed. Strollers are easy to move and limit your dog's exposure to diseases. A social puppy grows up to be a happy and friendly dog. It's imperative that you expose your dog to as many new faces as possible. Some veterinarians even say that your dog needs to have good experiences with 100 people by the time that they're 16 weeks old. That's a lot of people to meet in a relatively short amount of time! Proper socialization ensures that your puppy doesn't develop any biases or aggressive behavior. As dogs get older, their sense of wonder and exploration diminishes a bit. Instead of investigating new things, they may start to exhibit fearful behavior towards the things they're unfamiliar with. Some dogs can even get aggressive if they are exposed to something new. To stop this behavior, they need to be socialized at an early age. Have you ever met a dog that had a strange bias towards a certain type of person? It's not an uncommon thing. Some dogs don't like children while others have a strange hatred towards people with facial hair. Dogs develop these unusual ticks because they've never experienced those types of people at a young age. When you're socializing your pup, expose them to a wide range of different people. These include young kids, senior citizens, people of all skin colors, folks with different hair colors, and anything else you can think of. When your dog realizes that these different types of people are safe, they won't have any issues with them as an adult. The problem that many people have with socialization is the exposure that comes with it. Vaccines aren't completed until a dog is 16 weeks old, yet they need to meet 100 people before they reach that age. The numbers just don't add up! Just like letting your dog outside, you'll need to socialize your pup in a safe way. The best way to do this is to have people come to you. Your home is a safe environment that's free of diseases. You can have friends and family come by to spend some time with the pup. They can play games and develop a good relationship from the comforts of your home. Another great place to meet people is at a veterinarian's office. Veterinarians, technicians, and office staff are always ready to show some affection. Most vet's offices are safe for young puppies to walk around. If not, your vet will let you know. In addition to meeting new faces, a trip to the vet's office will give your pup the opportunity to get comfortable with these types of visits. What About Socializing with Other Dogs? Getting to know other dogs is just as important as getting to know humans. However, it needs to be done safely. The last thing you want to do is bring your dog to a dog park. Remember, you can't let them roam around an uncontrolled area until they're 16 weeks old. So, you'll need to set up safe play dates. If you know people with dogs, you can set up a meeting. It's always best to pair dogs up based on age and size. If you can find another young puppy, have them come over. It's important to be careful around adult dogs or those that are bred to be guard dogs. They may not have the patience to deal with the excitement of a young pup. Before you visit another puppy or have one come over to your home, there are a few things you need to check. The other dogs' owners should be on the same page as you when it comes to disease exposure, socialization, and behavior. The dog should be vaccinated. It's also important that the other dog hasn't visited a public dog park recently. They could carry germs and bacteria that affect your dog. As your dog is getting to know their new canine pal, keep a watchful eye on the two. A little bit of aggressive play is to be expected. Make sure that both dogs are comfortable and not hurting one another. If you notice some signs of real aggression, separate the two as soon as possible. Once your pup is fully vaccinated and protected, they can start playing with other dogs. They'll be ready to visit a public dog park and go for walks. When your pooch meets new dogs, you need to watch their reaction and make sure that any aggressive behavior is dealt with accordingly. In a dog park, your canine companion should be let off the leash. Most parks require that dogs are off a leash. This is because leashed dogs are more likely to show aggression. If your puppy was socialized when they were younger, they shouldn't have any problems having fun with others. Proper exposure and socialization are key. Your puppy is going through a lot of changes during the first few months with you. It can be a bit overwhelming for some puppies. To ensure that your dog is happy, healthy, and prepared, here are some tips that you need to know. There are a lot of ways that exposure can go wrong. All it takes is one infection for your dog to get sick or one negative experience to affect your dog's thinking. Before you let your dog socialize or explore a new place, make sure that it's safe for them. You need to do your due diligence to keep your pup as safe as possible. Look out for possible issues and avoid anything potentially dangerous. If something unexpected happens, such as sudden aggression, remove your pup from the situation and take action to correct it. Young pups are mentally flexible. You can prevent unwanted behavioral problems by acting fast. 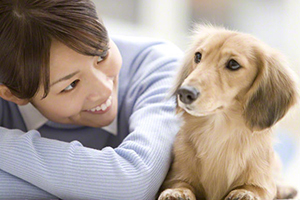 When your dog starts to show signs of stress or fear, you need to provide comfort and remove the stimulant. Many owners ignore these signs thinking that their puppy will simply get used to it. Unfortunately, these dogs are the ones that develop aggressive behavior as adults. Your dog needs to be shown that everything will be alright. Too much stimulation at one time can do more harm than good. A sudden influx of new sounds and sights will overload your dog's senses. This can lead to fear and anxiety. If you bring your dog to a pet shop, go during a time of the day when it's not crowded. When your dog is ready for walks, start on a relatively empty street with only a few cars passing by before you move to a crowded area. * If you go to a dog park, try not to visit one with a lot of rowdy dogs running around. You should start small and work your way up. This gives your dog plenty of time to process the new experiences. By the time you make it to a crowded street with a lot of people and barking dogs, your pup will have experienced all of those stimulants already. They'll still get excited, but it will be a positive type of excitement. To sum up, your dog can go outside, roam freely, and socialize with other dogs without many boundaries after 16 weeks of age. However, you can accomplish all of these important experiences before that with a bit of extra planning and precaution. By providing your dog with exposure early on, you're setting them up for a life of happiness and success.